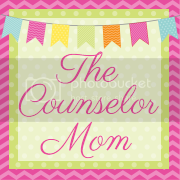 The Counselor Mom: Welcome Baby! We had a great birth experience at the birth center that I blogged about here. I was afraid that we might not be able to deliver there, since they wanted to induce me due to a umbilical cord issue, but it all turned out well. They use alternative induction methods where I had a catheter balloon inserted and they also broke my water. The balloon helped dilate me and then breaking my water sent me into contractions pretty quickly. I walked a little bit during labor, then got in the jacuzzi tub which really helped curb the pain! I was thinking I would have another hour at least of painful contractions, but then all of a sudden I was ready to push, and out she came! Two hours of labor, not so bad! I have my genes to thank for that, and my midwife and assistants in helping me not go for the pain route which can slow down labor. AND, we chose the name Belle after waiting 3 days to decide. I know, call me crazy. I loved the suggestions you all gave us, and there were some big top contenders, but we couldn't agree on a lot of them. We went back and forth and I was so glad that we waited, because some of the choices just didn't suite her sweet face. I wanted something different to go with our first child's name Luna. So we went with another favorite of mine, Belle. It means beautiful in French and I think it's very fitting! We are adjusting to life now as a family of 4. We are so happy our extended family has also stepped in to help us with that, and we also are super thankful for the post partum doulas that we hired the first few days. When you have a baby at a birth center, you go home 6 hours later, and are on bed rest for 3 days. So the doulas and my family helped me recover, take care of chores and the baby. I loved how they reminded me that up until the past 50 years, most women took 40 days to recover from childbirth by relaxing and letting family and others help with older children and housework. It makes sense to me! I am so excited at being a mom to a new baby girl, and I love now saying the plural phrase, "my children!" Yay!!!! So excited for your beautiful family of four - so neat to see Belle make her first Blog appearance! Well done, Mama!